A United Nations supply convoy has been attacked near the city of Gao in northern Mali, with two civilian drivers killed. 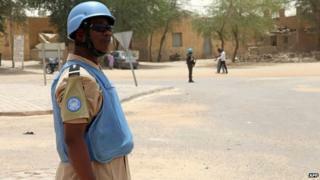 The attack took place about 15km (9 miles) west of the city late on Friday, the UN Mission in Mali said. The UN took over security after French-led forces intervened to retake northern cities from Islamist militants in 2013. But at least 35 UN troops have been killed and 140 wounded since July 2013. The al-Qaeda-linked militants fled into the Sahara desert after the French intervention and have since carried out suicide bombings and hit-and-run attacks on the UN troops. The UN mission (Minusma) said that in the latest attack gunmen stopped the convoy and "coldly killed two of the drivers" before setting the trucks on fire. A third convoy member was wounded. On Wednesday a suicide attack on a UN base in the town of Ansongo in northern Mali killed three civilians and wounded nine peacekeepers from Niger. Al-Mourabitoun, a group headed by former al-Qaeda fighter Mokhtar Belmokhtar, said it carried out that attack. The United Nations has some 9,000 personnel in Mali. Northern Mali has been a flashpoint of conflict since Mali's independence from France in 1960, with Tuareg rebels campaigning for independence or more autonomy. The emergence of jihadist groups in recent years has made the conflict even more complex.